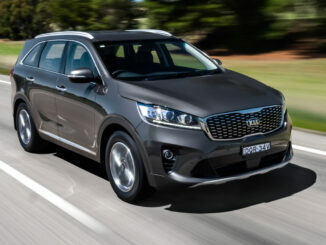 A fun and nippy small family SUV! 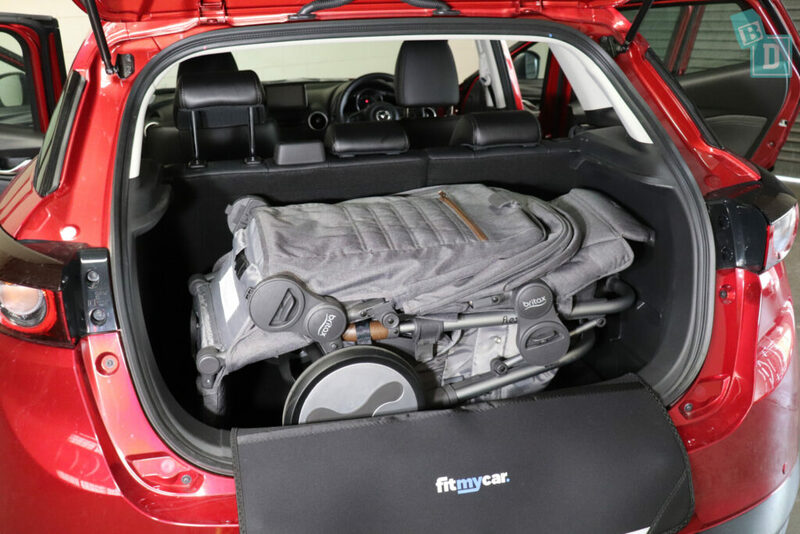 SPONSOR SHOUTOUT: I used a bumper protector from our sponsor FitMyCar, which is fantastic when you’re moving a heavy pram in and out of the car and need a way to prevent damaging it with bumps and scratches. They have a great website where you pop in your make and model, and they’ll show you all the accessories that fit along with a picture of the car to make sure you’ve got the right products. Delivery is free to your door too so it's a huge time saver! If you find BabyDrive helpful, please support us by supporting our sponsors! 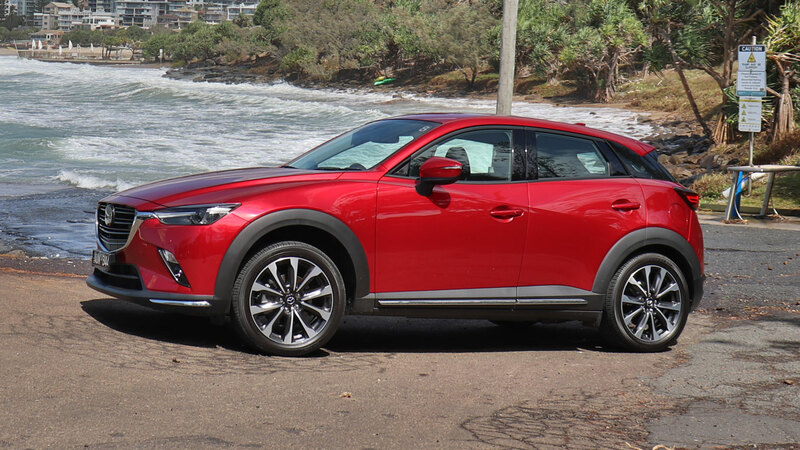 Mazda is Australia's top-selling car brand to private buyers and I can understand why as they do a lot right, as most of the Mazdas I have tested so far have been lovely stylish cars that are great to drive and practical too. Naturally, I was looking forward to testing the CX-3 and seeing how it fares for families shopping in the small SUV segment! Lots of people only have one child so they simply don't need a big car, or they live in the city so they don't have room to park a large SUV, or they have a larger family car and then a small run around for work and occasionally transport the kids as well. For whatever the circumstances I was looking forward to putting this little red car through BabyDrive testing!! I was given a BEAUTIFUL red CX-3 to nip around in!! It's like a luscious deep, velvety red lipstick! (That I used to wear pre-child!!!) It was a lot of fun getting about in the CX-3; it was like the bulky, frumpy practical side of parenting was forgotten and I could just nip about in something nimble and carefree for a week! The CX-3 was great on the open roads as well as being easily maneuverable around town and in small tight car parks etc. I want to start by telling you my most favourite feature as I hadn't acknowledged it when I made the video so I am hoping if I put it right at the start of the written review most people will read it… The CX-3 we tested has THE BEST keyless entry and exit! I didn't even need to press the key! Just coming near it unlocked the doors AND when I walked away from the car it locked itself automatically… MY FAVOURITE FEATURE!!!! It doesn't sound like a lot but it's a life changer!! To never have to fish around for your keys again with arms full of a lunch box, wet paintings, half-eaten snacks and a toddler that decides they couldn't possibly walk from the car to the house and demand a ‘pick' even though your arms are laden already!! This feature was GENIUS!! 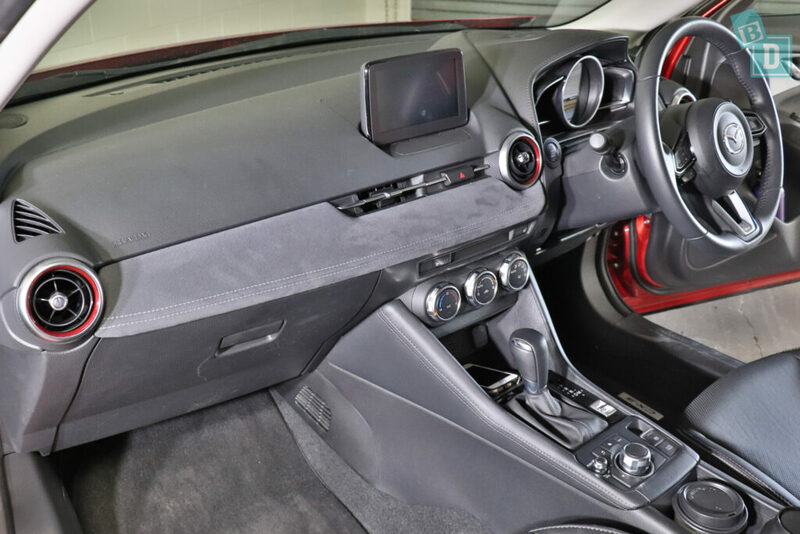 The interior of the CX-3 is nice, the exterior red carried through to the aircon vents is a nice detail and it has a neat interior on the whole. There are suede panels on the doors and dash which were a magnet for my daughter's toddler hands and might be hard to keep clean. Now where's that suede protector spray I use on my cowboy boots? Storage inside the cabin was compact but very practical, holding everything you'd want with door bins that hold large refillable water bottles and a glove box that holds an iPad, wallet and the manual. All good APART from the central console cup holders which were really flimsy and wouldn't hold anything properly! No parent wants to risk spilling their caffeine!! I could fit two child seats in the back of the CX-3 and I wouldn't expect to fit three child seats in the back of a small car like this. The two fitted well with space for the fold-down cup folders between them, although there wasn't room for me to sit between the two seats. 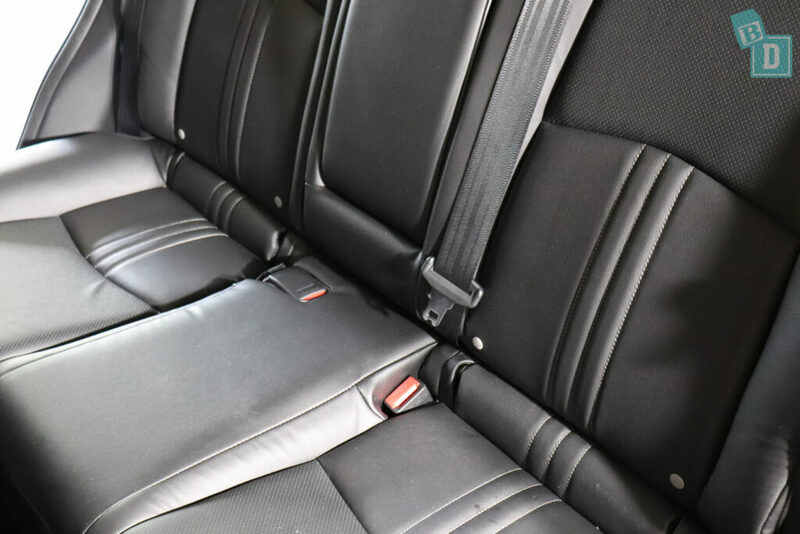 There are top tether anchor points in the back of all three rear seats and ISOFix in the two outer seats, but the ISOFix were a little tricky to connect because they are buried within the seat upholstery. 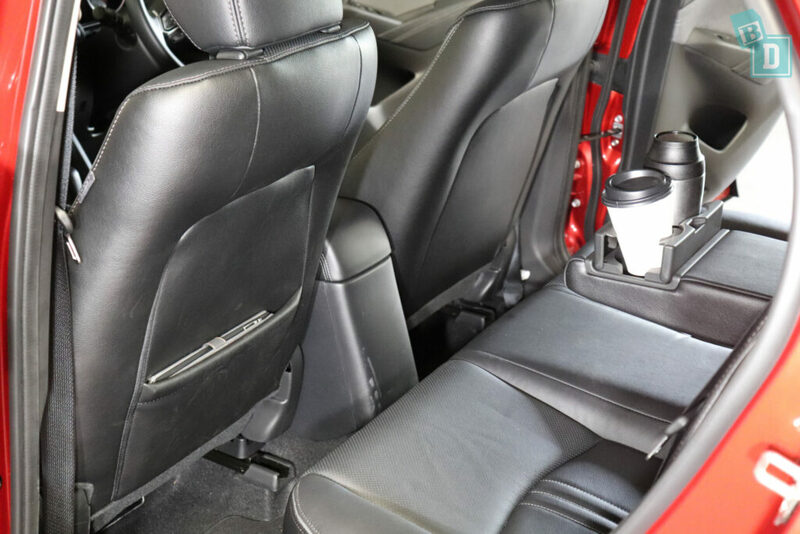 Legroom is something to consider with the CX-3. With the rear-facing child seat installed, I could just sit in front of it in the front passenger seat and I'm 162cm. Also, it is quite a low vehicle, so swinging my heavy toddler into her child seat and leaning in to fasten her harness was wearing in a low car. 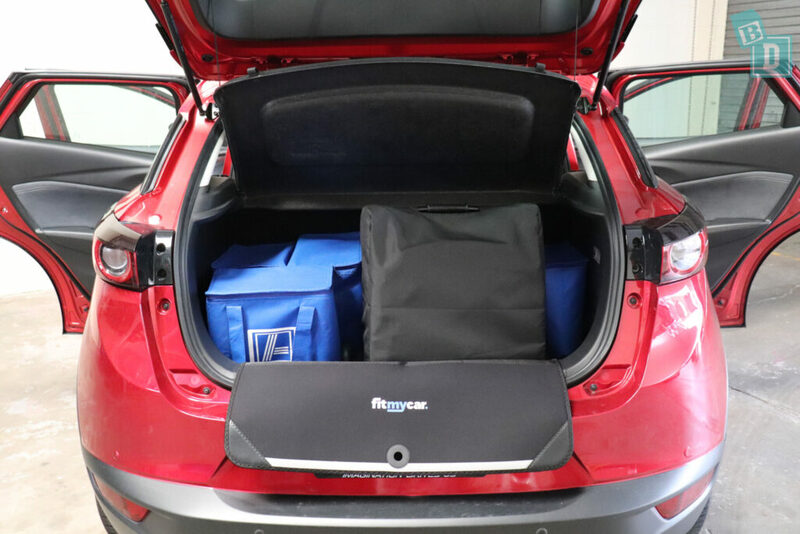 You can raise and lower the boot floor of the CX-3, which enabled me to fit a twin stroller in the boot, with a shopping bag, with the parcel shelf removed. It did, in fact, fit all styles of stroller just with varying numbers of shopping bags. It was a squeeze for the bigger ones so I used a bumper protector from FitMyCar so that I didn't damage the car. I've never been a huge fan of the Mazda media systems because of the rotary controls and it just feels a little outdated. Mazdas now come with Apple CarPlay and Android Auto or you can have it installed for $500 so that really is a major improvement! The media screen is quite small and that was a concern when reversing and using the camera, the image was low res but quite clear and being a small car you can tell where the parameters are more easily. In the CX-5 I found the wing mirrors created big blind spots when driving but I did not have this problem in the CX-3. There is a good seatbelt removal display in the dash for the rear seats which I really liked so I could see if anyone unplugged their belts. Overall I found the Mazda CX-3 to be a fun, little car to drive, and if you only have one child or two and parking is a problem then it is practical too. 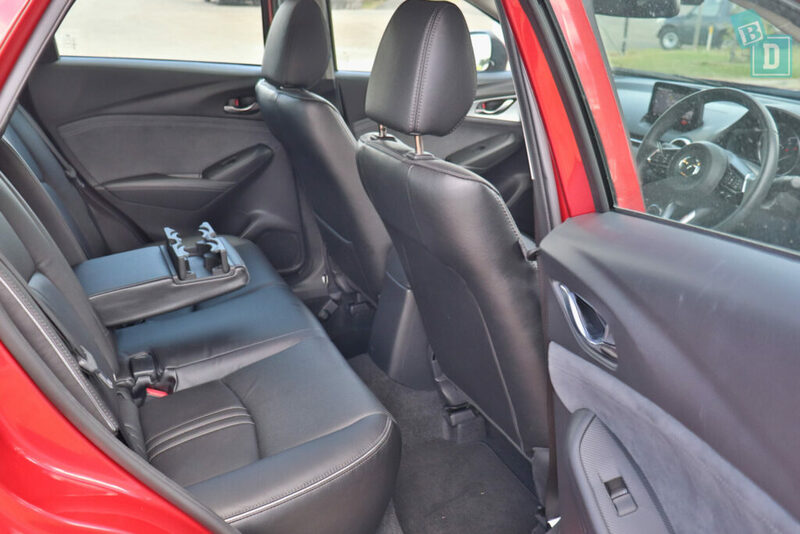 Like the CX-5, it has a good quality interior, with thoughtful storage and adequate boot storage you just need to consider the legroom and where anyone taller than 162cm is going to sit with child seats installed too! The Mazda CX-3 scored a five-star ANCAP safety rating. It has six airbags as standard dual frontal, side and head airbags in the front and head airbags only in the rear. 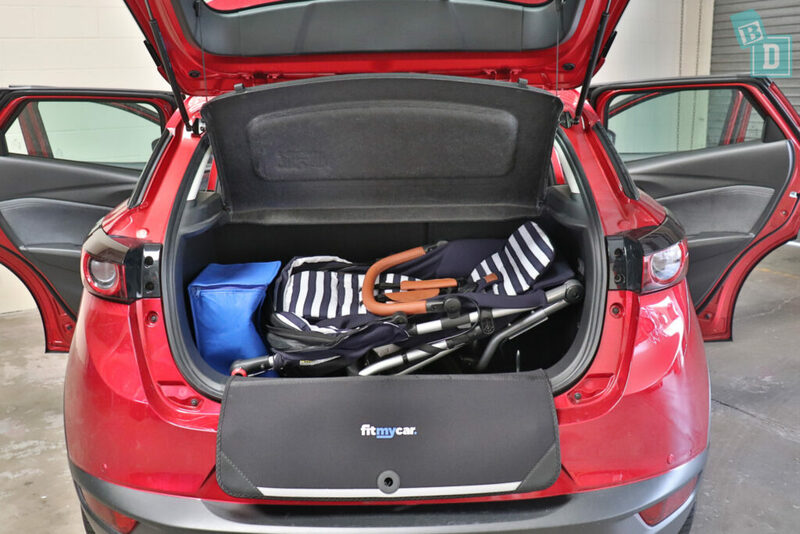 How good is the storage in the Mazda CX-3 and can you fit your stroller in the boot of the Mazda CX-3? Luckily yes! The floor of the CX-3 boot moves up and down so you can change its depth. If you are not carrying a lot then the upper position is great so you are not bending as far or as I found, strollers fit better with the boot floor in the lower position. With the boot floor in the lowest position, it would hold eight shopping bags. The Mountain Buggy Duet twin stroller would only fit with the parcel shelf removed and on its side in the boot, with one shopping bags beside it. The Britax Flexx tandem stroller would fit with the parcel shelf but no shopping bags fit beside it. The Mountain Buggy Urban Jungle pram fit with one shopping bag alongside it. 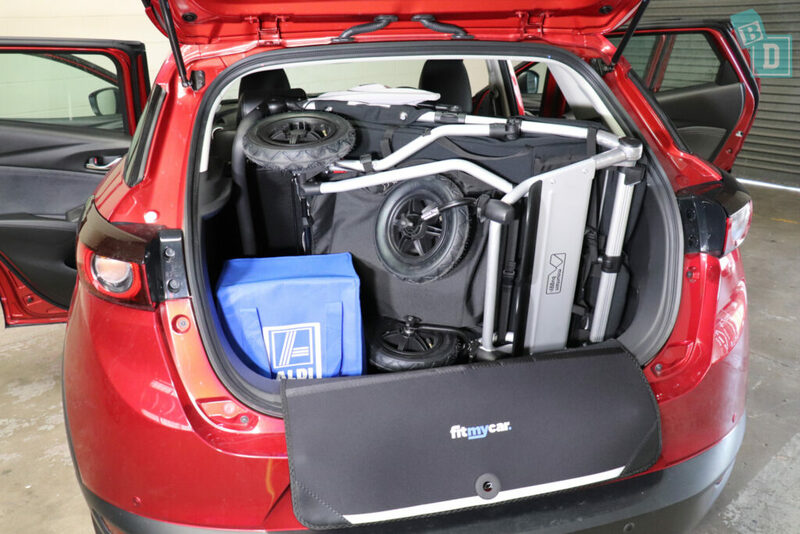 The Mountain Buggy Nano stroller fitted in the boot of the CX-3, with six shopping bags around it. 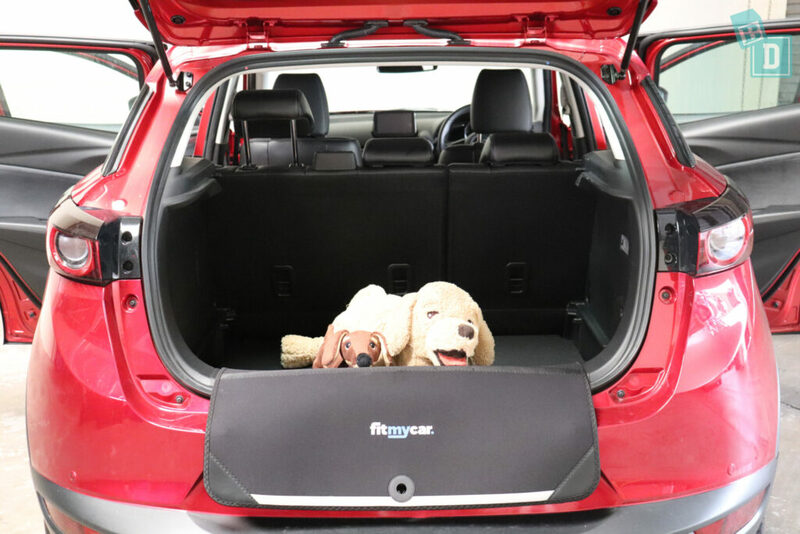 Or if you remove the parcel shelf you could transport a small dog. 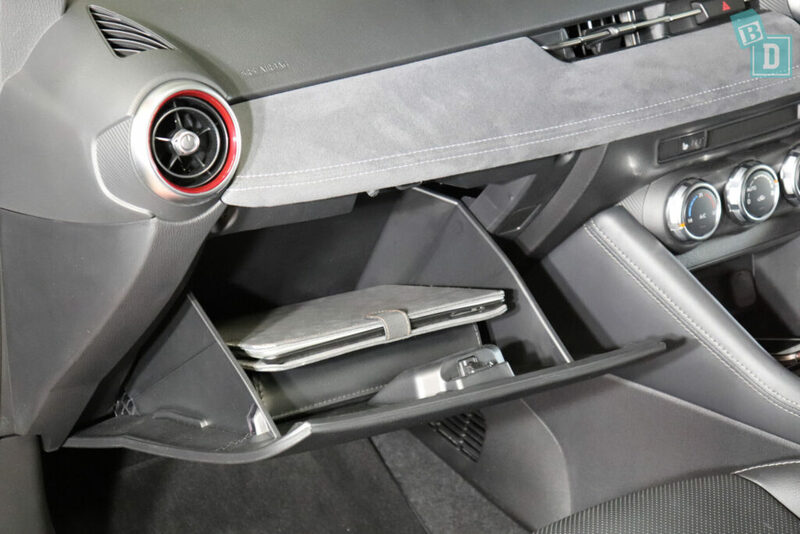 Storage inside the CX-3 is compact, it's all there and it's practical. Apart from the front cup holders, which really feel like an afterthought! Whoever signed them off has never been up all night with a child and needed caffeine the next morning I'm sure!! They are flimsy foldaway flaps that do not hold anything securely and a re-usable or disposable coffee cup do not fit in them well at all they really move around in them and easily spill the contents. There is a small storage box for the central console box as well behind them. That rant over the rest of the storage was fabulous for such a small car. 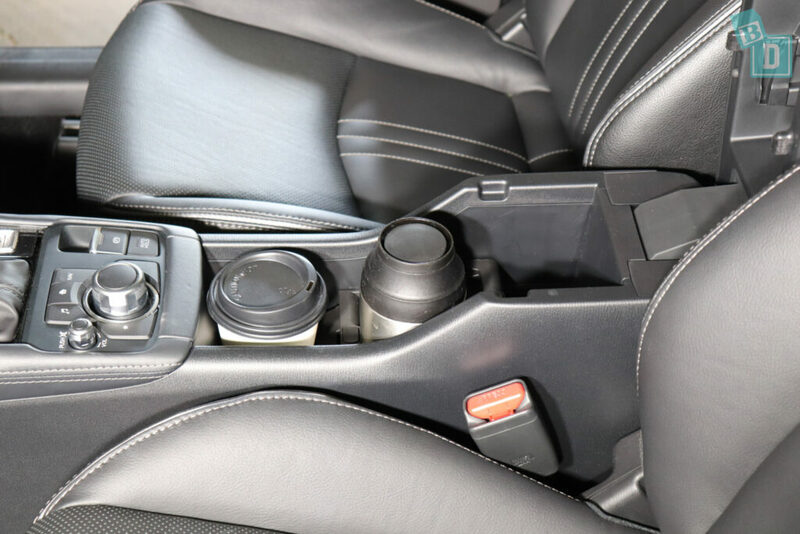 The well in front of the cup holders was perfect for storing my phone and charging it is where the USB port is located. 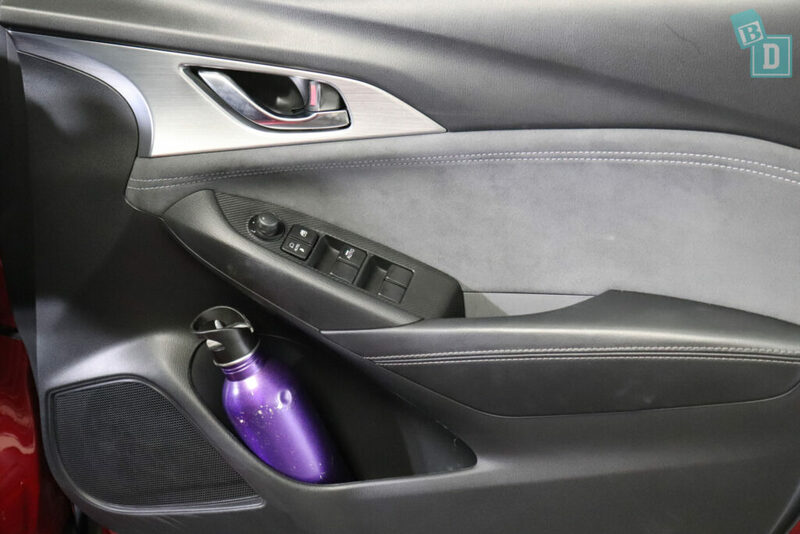 The door pockets in the front of the CX-3 will hold a large refillable water bottle which is fantastic and a 600ml would fit too and there are little wells in the door handles. The glove box of the CX-3 is not as small as I've found in some much bigger cars, I can fit my iPad in there and wallet with the manual. In the ceiling, there is a lined glasses case, so your lenses do not get scratched. In the rear seats, there is a map pocket on the back of the front passenger seat only. It will hold but not conceal an iPad. 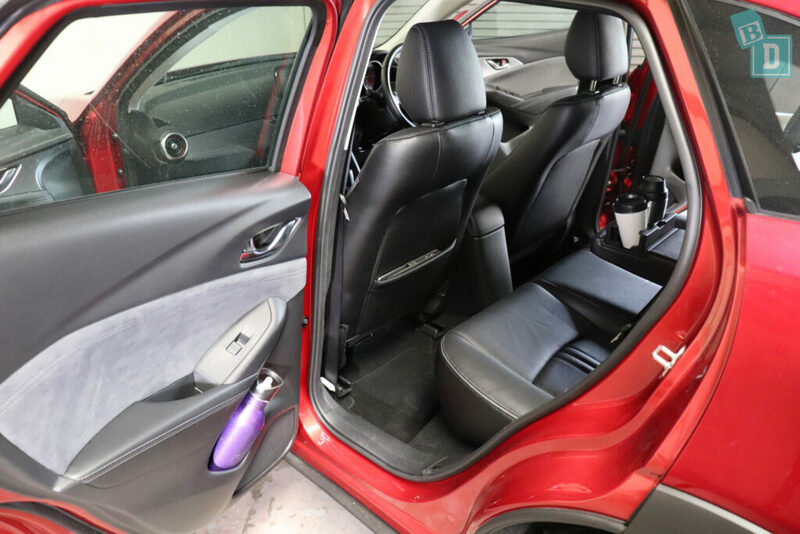 Like the CX-5, all the doors have good sized rubber-lined wells in them as handles, these are a great BabyDrive feature as I find them really useful for popping whatever my daughter has in her hands in while I buckle her up, or to put the car keys in. The rear door bins are a little smaller than the front but a large refillable water bottle still fits well in it. How noisy is the Mazda CX-3? The parking sensors in the CX-3 are similar to those in the CX-5 and are very BabyDrive friendly! By the driver's right knee is a panel of buttons where you can turn the parking sensors on and off if you turn them off, they are off until you turn them back on again, they don't automatically come on next time you are in reverse which is great!! You don't need to worry about them at all if you are driving bubs to sleep! There is also a button here for the camera angles so you can change to the view which is helpful when you are parking. 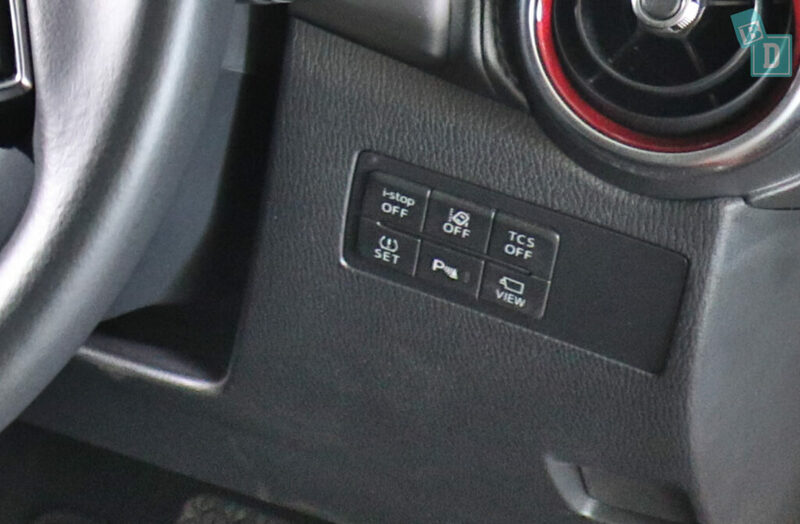 The auto engine cut out switch, it’s called i-stop in Mazdas, is on the same panel of buttons too and it is great to be able to turn that off as it can be disturbing for sleeping bubs as well. 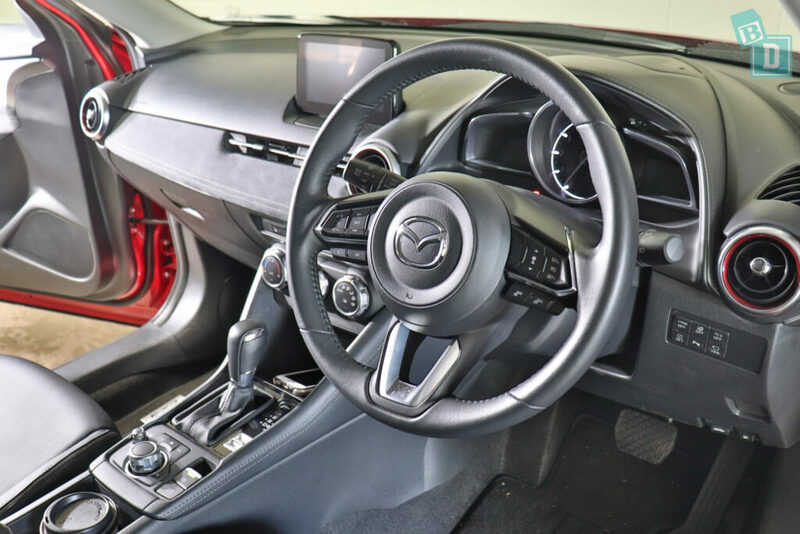 The Mazda CX-3 has a vibration in the steering wheel for the lane departure warning and there is no beeping accompanying it, which is great for not disturbing the little passengers or driving parents nuts!! The indicator volume in the CX-3 is not adjustable, it is quite quiet though so I didn’t find it affected my daughter while she was sleeping. The car that I tested did not have Apple Car Play or Android Auto but if you bought one today it should because now Mazdas do come with Apple CarPlay and Android Auto or if you have an older model you can have it added for around $500. I still find controlling the media system with the wheel down in the central console a little annoying as I have to take my eyes off the road, to look down at it, to use it while driving. I didn't find the sat-nav particularly easy to navigate and use, so I will be happier when I can use Apple CarPlay and the maps on my phone. Opening and closing the doors and windows of the CX-3 did not seem to be as baby waking in volume as the CX-5 was! Road and engine noise are good in the CX-3, it could be a little revvy up hills at times but it is a nimble little thing and a lot of fun! 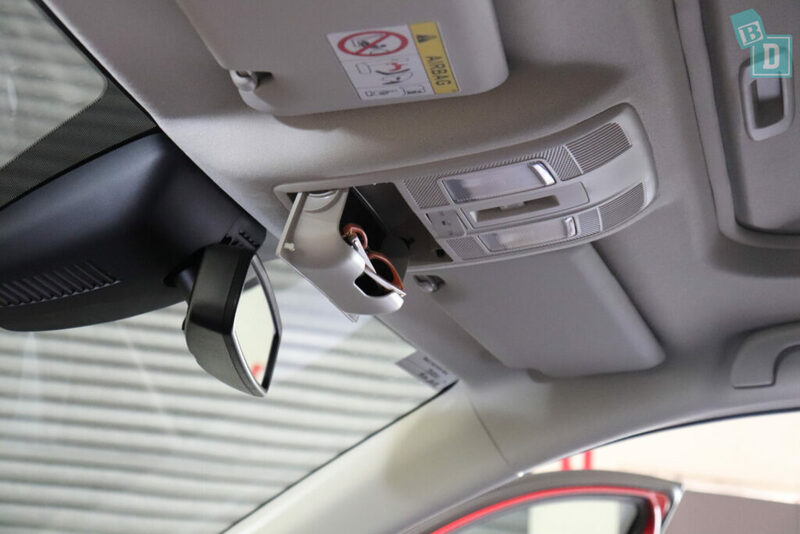 There is a great seatbelt removal light panel on the central dashboard and an alarm goes off if any seatbelts in the car are removed whilst driving. 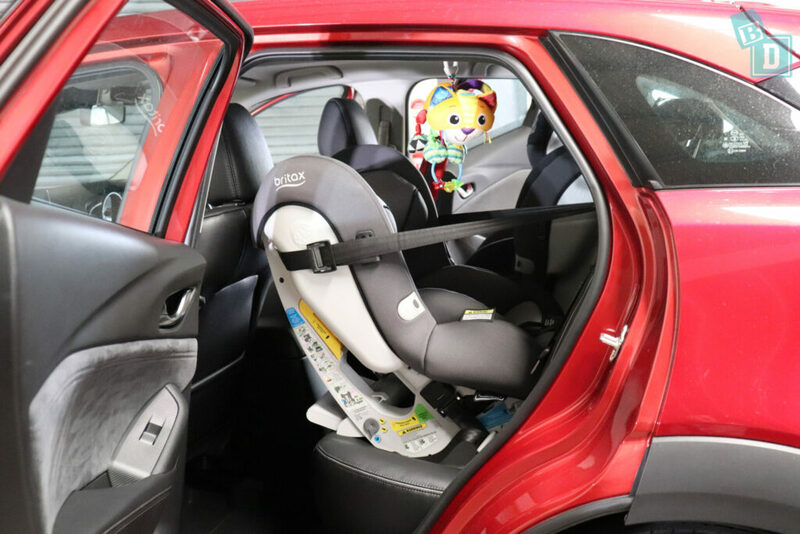 How many child seats fit in the Mazda CX-3? I could fit two! 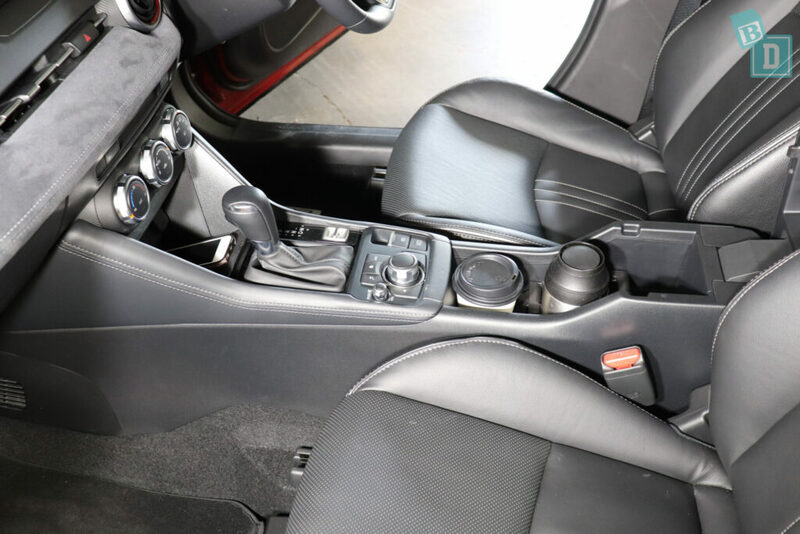 The Mazda CX-3 is a small five-seater, it has ISOFix anchorages in the two outer rear seats, but they are not within plastic guides and instead are within slits in the leather seat upholstery, which I found made it really quite difficult to attach the connectors to. There are top tether anchor points on the backrests of all three rear seats, which are within plastic guides and I found them easy to connect to through the boot. I was not at all surprised to find I could only fit two child seats in the back of the Mazda CX-3. With the two child seats installed in the outer positions, there was no room for me, or anyone, in my opinion, to sit comfortably between them. Legroom may be a consideration too if you have anyone over 162cm in your family as I could only just sit, in the front passenger seat, with a rear facing child seat behind. 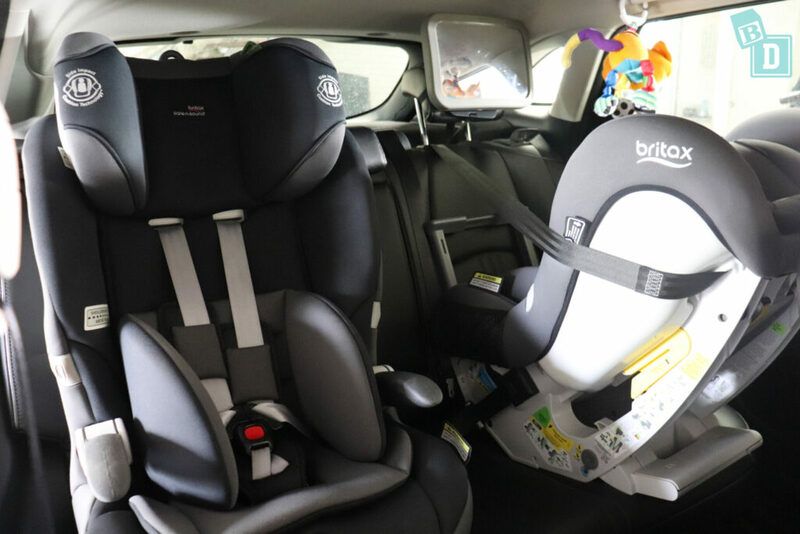 There is a bit more legroom to divide up with forward-facing child seats however you may find you end up being kicked in the back A LOT!! Posting bub into their seats from outside the car is quite tricky. It is a small and low vehicle so squeezing them through that little gap is difficult into a rear-facing child seat and I found swinging my oversized toddler into her forward-facing child seat was a work out in itself. Also bending down in to do it up harnesses you realise that interior space is tight. From inside I found it a bit better with the rear facing because the ceiling is higher than the door frame. With only one child seat installed, there is enough room for feeding bub in the back. 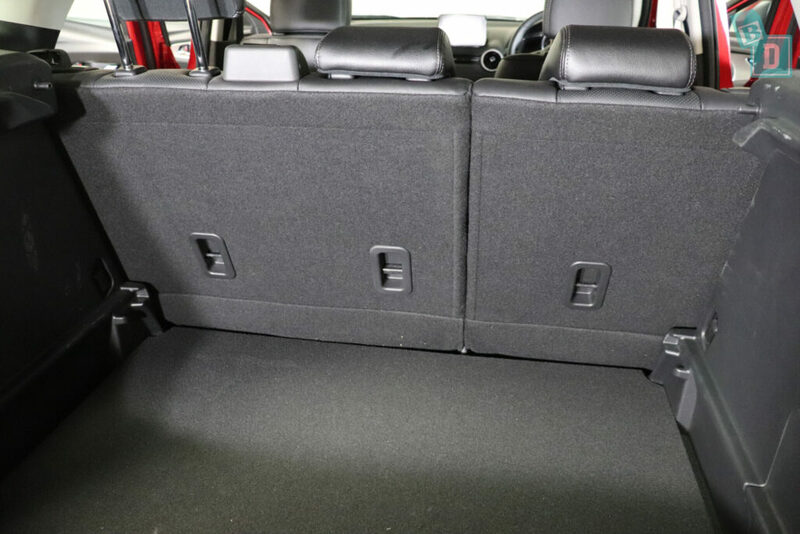 The rear seats have perforated panels to match the front ones, which make it harder to keep them clean with children’s mess and spills. Also, the doors have suede panels above the handles which I was very nervous of my daughter getting her sultana fingers on! How comfortable is the Mazda CX-3 as a family car? The front seats of the Mazda CX-3 are very comfortable, in the version we drove, they had electric adjustment controls on the sides. The seats are comfy and firm but I could not wear a ponytail because of the headrest shape! The black leather seats are perforated in the central panels for the heating. I love this feature in cars and I always play a little prank on the front passenger by popping theirs on!! 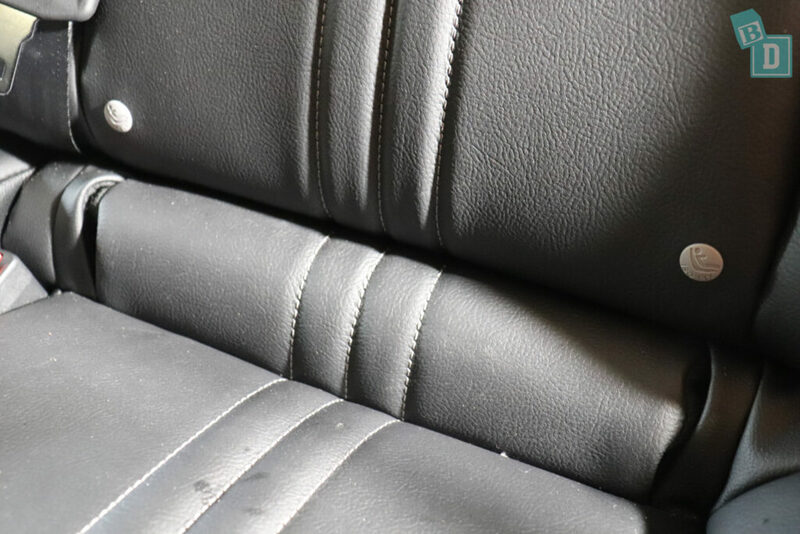 The front seats have some stitch detailing, with the perforations as well will make them harder to keep clean with children's crumbs and spills. In the back, the seats are very comfortable too, they have the same stitch, seam and perforation details as the front ones, which will be even harder to keep clean with kids on them! Legroom is very tight in the CX-3. With a rear-facing child seat installed I could only just sit in front of it in the front passenger seat, there was 12cm of knee room! This is a consideration if you need to fit two child seats in the back and either front passenger is over 162cm. There is a bit more legroom to pay with putting forward-facing child seats in the back but we still had a lot of “STOP kicking the back of my chair” conversations!! The steering wheel is fully adjustable in/out and up/down, which is especially helpful in the CX-3 for taller drivers to feel less cramped. I found the cruise control to be relatively accurate on fast straight roads as well as at lower speeds on undulating roads. The cruise control buttons are situated on the right-hand side of the steering wheel and like most Mazdas, I have tested they are simple to use. In front of the steering wheel is a digital display showing the distance to empty for the fuel, which I find really useful now I'm a mum. 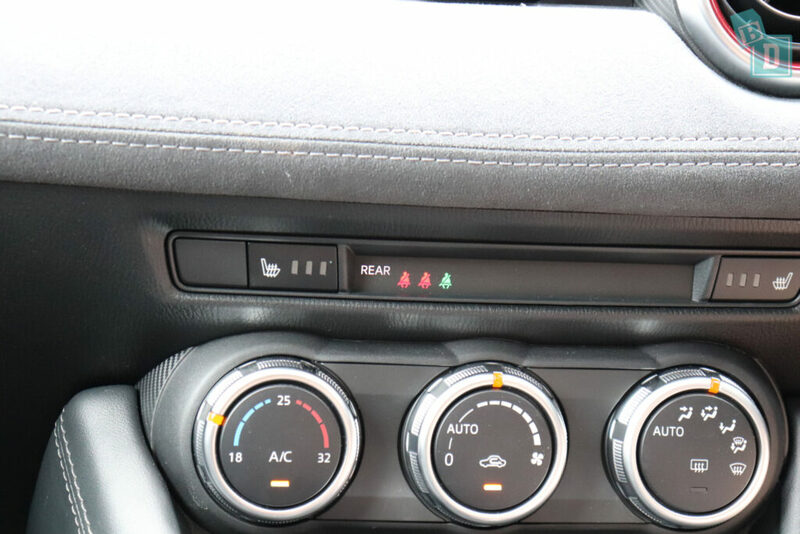 There are three round air-con vents across the front dashboard; one in the centre and one at either end and a rectangular vent in the central dash too. 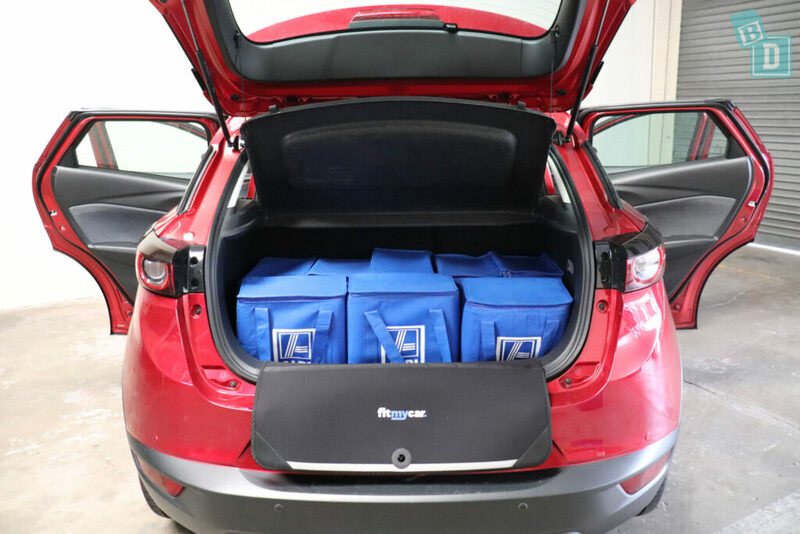 There were no air-con vents in the rear of the CX-3 I tested but I found, with it being a small car, the aircon in the front was enough to cool the whole cab quickly and keep the rear passengers happy by directing the central round vent to the back seat. 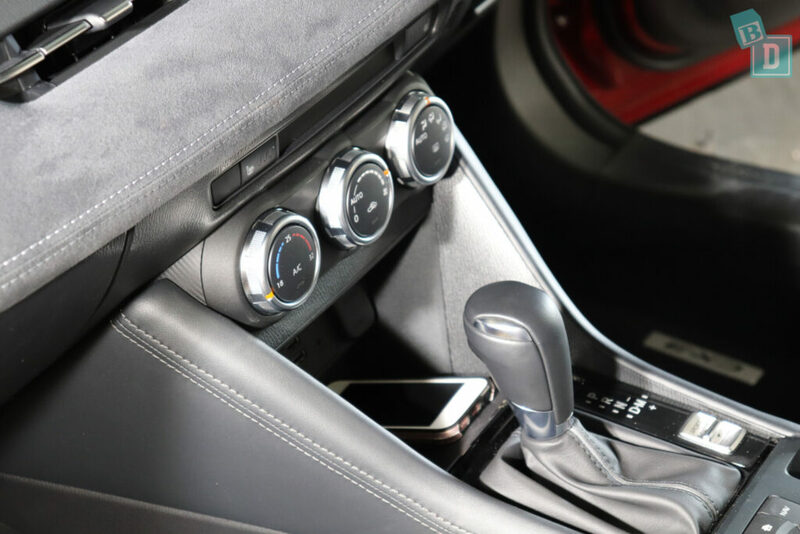 The aircon controls are three round dials in the central dash that are easy to use and reach while driving. Visibility for the driver in the CX-3 was quite minimal out of the back and sides with two child seats in the back because they just filled the windows! Out of the front, it was good and the reversing camera helped with maneuvering in car parks etc. Being a small car you do know where the extremities of the CX-3 are and there is no bulky bumper, for example, that you can't see. One thing I have noticed since being a mum is I hate it when I reach a destination or get home from being out and Tulsi has either done really well in the car or she is screaming her head off and I have done really well to keep it together for the entire journey (usually the latter!!) and it takes 10 minutes to park the car! It can be really stressful. Usually I dread when we get big cars or Utes as they take longer in our tight apartment block carpark, but the Mazda CX-3 although only a small SUV was tricky to reverse park too with child seats installed! 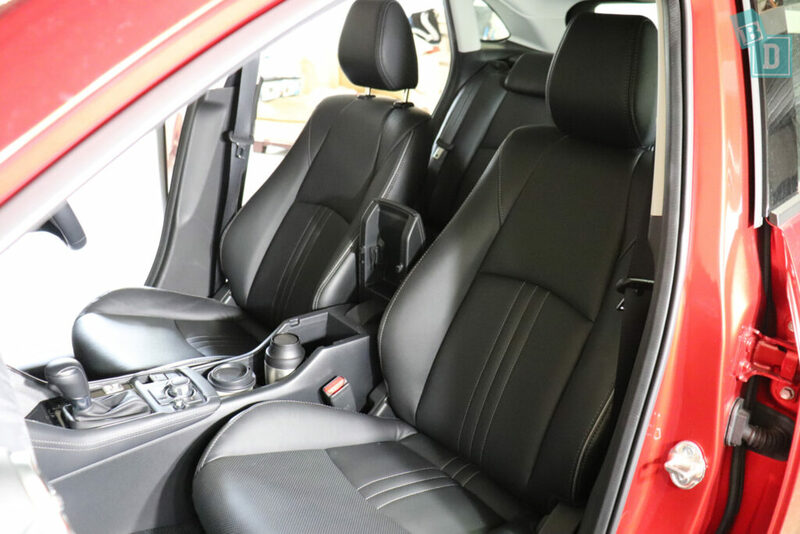 For rear-facing passengers in the back, the windows are quite large so forward-facing passengers can see out and the triangular third-row windows also help rear-facing passengers seat a bit more and let a bit more light into the car. The interior lights in the front simply press on at either side of the sunroof control in the ceiling. The two rear lights are also pressed on and are situated in the ceiling just behind the sunroof and front seats. They are easily reachable while you are driving, because the car's small it's not too far to reach! I have found the CX-3 a fantastic, nippy little car to drive around town and out on the open roads. Without all the inflation of large SUV's, I felt quite carefree and life felt simpler buzzing about in it for the week with my girl. The handles above the rear doors in the back are useful for hanging a baby toy from but that did add to the cramped feeling in the back and made visibility even harder for the driver. 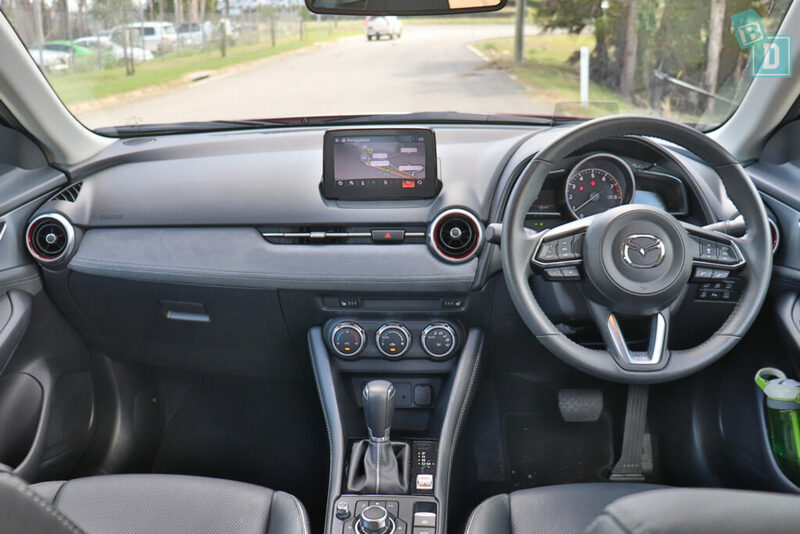 We drove the top spec model Mazda CX-3 and the interior was nice, the suede panels on the doors and dash I worry will become marked and dirty easily with kids but it has nice details for a small car. The red in the air vents I'm sure is a slightly different shade to the exterior of the car, which bothered me a little but I appreciated the intention. Apart from the suede panels, most surfaces would wipe clean easily. There are carpet floor mats in the front and back of the CX-3. The CX-3 we drove does have keyless entry and a powered tailgate and I LOVED that I didn't even need to press the key! Just coming near it unlocked the doors AND when I walked away from the car it locked itself automatically… MY FAVOURITE FEATURE!!!! The Mazda CX-3 was given a five-star ANCAP safety rating in 2015. In testing, it scored 36.44 out of 37. For the frontal offset test, it scored 15.44 out of 16 and full marks for side impact and pole crash tests. The Mazda CX-3 has six airbags as standard. Both front passengers have front and side airbags and curtain head airbags extend to the rear passengers as well. As standard, the Mazda CX-3 comes with seatbelt pre-tensioners in the front and rear outboard seats, anti-lock brakes (ABS), electronic brake force distribution (EBD), electronic stability control (ESC), emergency brake assist (EBA) and emergency stop signal (ESS) and hill launch assist. Also optional on base variants but maybe standard on higher variants is rear cross-traffic alert, autonomous emergency braking (AEB), blind spot monitoring (BSM). 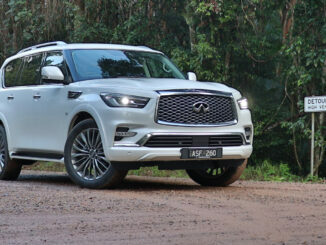 Not available on base variant but standard or optional on higher variants is reversing collision avoidance, lane departure warning (LDW), daytime running lights (DRL), automatic headlights, automatic high beam.